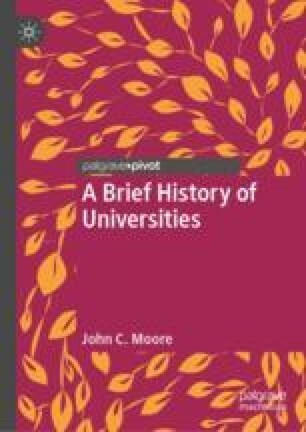 The nineteenth century, broadly defined, is described by Moore as one of the most important periods in the history of universities. The French Revolution, the “Berlin model” of universities as research institutions, the Industrial Revolution, and finally the new Imperialism, all these had dramatic impacts on the development and expansion of universities. The emphasis on universal natural rights and individual freedom caused rebellions throughout society. The needs of industrialism produced more technical schools, many of which evolved into universities, and engineering became a standard part of higher education. Industrialism also created new classes ultimately to outweigh traditional classes: a laboring proletariat replacing peasants and a bourgeoisie replacing aristocracy. New movements like democracy and Marxism found channels to the world through western imperialism and its universities.